Sleeping Beauty’s voice is that of a siren, and only the fairy Malynn realizes the terrible nature of Rosalynn’s power. Malynn is not a typical fairy. She cares for humans, only her winged brothers and sisters. When she sees the princess taking advantage over her royal parents and her subjects, Malynn must interfere. The only way to silence Rosalynn’s silver tongue is for her to sleep. But the curse is broken, and Rosalynn awakes. Has all of Malynn’s efforts to save Fantasia been in vain? 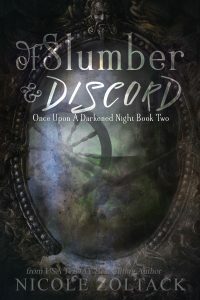 Of Slumber and Discord also includes the short story The Cost of Magic.